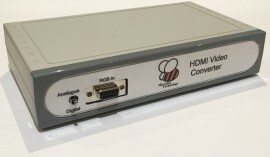 Designed to enable the use of TV's or LCD monitors with older computers, the Microbee HDMI video converter allows for analogue or digital inputs. The digital mode converts true CGA digital input (RGB + Intensity) and provides the proper CGA color map. This is the mode that is used by the Microbee Premium, Premium Plus & 256TC models, along with regular IBM PC’s (CGA card) and numerous other computers. Includes an internal jumper to select 'C128FIX' mode that changes the color map to correctly emulate the Commodore C128 RGB color map. The analogue mode allows for use with other computers that have true analogue outputs, such as the Commodore Amiga (the converter has been tested with the Amiga & works brilliantly!) and Atari 520/1040ST. Normally it works with TTL level positive HSYNC & VSYNC as the timing signals. It also has options to set the sync polarity for odd-ball video systems that differ from positive sync (15Khz) via jumpers. It can also work with a composite sync signal. This new version of our VGA Video Converter has HDMI output instead of the 15pin VGA connector. HDMI out only.